I know the team has shipped the in pelican cases before ($$$$). And I’ve done some scouring in the forums for info. But has anyone come up with a solution to travel with the yet? I’m wanting to take her out in the wild a lot and need a practical yet professional looking way of doing so without selling my first born for a pelican case. Dunno if I would trust anything else. I had a Nikon D2H back in the day when I was doing wedding photography and cheapen out on the case. Which was a bad idea. As that cheap case cause 872$ in damage. Build a fancy plywood crate. Hinges, handles, interior bracing, foam padding, paint and travel stickers. All I’m thinking of now is some sort of home made case out of lots of draftboard and craft foam lol. I was looking at road cases like used for music and film equipment and even they are $600-$800 for something the glowforge will fit into. However they are plywood which is fine if you are the one doing your own transporting, but plywood is somehow magnetic to UPS forklifts so I would not ship common carrier. 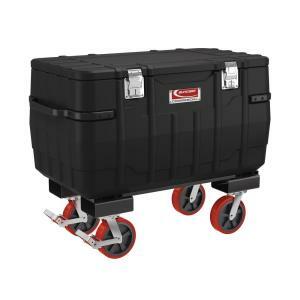 If you’re going to be just packing it in & out of the car to take it to places you go (and not entrusting it to other common carriers) then take a look at the different tool chests and storage units at Home Depot or Lowes. The ones in the truck section not the ones in the tool corrals for your garage. They’re often used for job sites or storage in a truck bed. If you find one that’s appropriately sized, transfer your GF box foam into it and use that. I’ll love to see what you come up with! Keep in mind that it’s pretty important that the unit stay in its upright, horizontal position. Are you talking about a JoBox? I have a “small” one (a GF would not fit in mine) Those things are strong and forklift-proof, but man are they heavy! Thanks for the advice! Looks like it’s off to sell a kidney! Yeah this is what I was thinking. I’m not planning on bringing it air traveling with me just in the back of a vehicle from space to space. Good idea on the foam! Are you talking about at JoBox? I have a “small” one (a GF would not fit in mine) Those things are string and fork-lift-proof, but man are they heavy! Sort of. They have a couple of plastic ones that look sorta Pelicany but not as expensive. They have one that’s over 4ft long that’s about $250 but I don’t know about the height & width measurements. I mean, a steel jobsite storage case would protect the GF, but you would probably want it to be on wheels, and have a tommy-lift on the back of your vehicle. Actually, that would be a pretty sweet setup. Ambulance gurney… wheeled legs that act as a stand for use at a show, and removable flat material storage underneath. When you’re ready to pack up just wheel it to your vehicle and the legs fold up without you needing to handle the weight of it. You could add wheels if there aren’t any. Or how about a footlocker? Old school but with the foam inside it should work for the OP’s purpose. It looks like I’ll be building something a little like that, only completely bodged out of conduit. Let you all know if/when it works. Check some of the military surplus auctions. It seems to me the Pelicans are based on the earlier military cases anyway. Just lost my left kidney due to cancer. Can’t say it would be an even swap!